Do You Have a Lottery Strategy? It's NOT about complicated software, crazy unproven theories and expensive systems. Winning the lottery is about Strategy, and Luck. That's it. I can't help you with the Luck - because Lady Luck decides if she's going to visit you this week or not. But I can help you get a solid Strategy in place. And that can make a world of difference to your chances of winning. I can now give you the best lottery training that I've ever seen, at a price that makes a mockery of those crazy '$97 junk systems' that don't even begin to really help you. The Timing Technique - most players just blindly play every draw, but this can actually hurt your chances of winning! How To Pick Lottery Numbers - so many lies and half-baked theories! Myths busted, and the real truth about picking numbers. World Class Wheeling - it's not what they claim, but wheeling is useful. Find out exactly how it can help and why. Plus you get access to some world class wheeling software - the easiest to use that I've ever seen. Because this is not free, it means I can also give you priority support. I'll still help out other people where I can, but my Private Members get priority, with faster and more detailed help. Plus you'll also get some other cool Tools & Toys to play with too. There's a really neat Lottery Calculator that will help you easily check odds and combinations. There isn't a better one anywhere online. And a very cool Number Generator that copes happily with Powerball games too - far simpler to use than anything I've seen before. A much enhanced version of my Lottery Compare Tool. Members get access to far more games (256 last count! ), and the data is bang up to date too. Plus there's my Easy Wheeling Software which includes a selection of world class wheeling systems that make sense. You've never seen wheeling software this easy to use before. And the Combinations Generator that can create a full set of combinations for pretty much any lottery game you care to choose. With more toys to come too? The exciting thing is you get to choose what comes next too. You should see my list of 'possible new toys' :-). But the floor is open - if there's a tool you want or need, just add your vote. I can't guarantee it will get created but if enough other Members want it too, then it will! And as if that wasn't enough already :-). One of the most popular services I've provided over the years is my reviews of lottery systems and software. Of course most of that stuff is just junk - but 'shiny new ones' keep coming out all the time! So how do you know what's worth buying, and what isn't? That's where you submit whatever shiny new thing you've seen to me for a review. 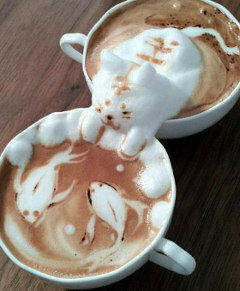 Then I take a close look for you, and give you my expert opinion. That alone will save some people $50+ a month! Each issue is packed with reviews, features, news and a little quirky entertainment too... I might be an acquired taste, but you do get used to me :-). 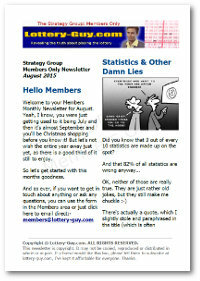 And I'm not the only one who reckons the monthly newsletter alone is worth the cost of joining! It's going to be a fun ride, and I can't wait to have you aboard. There's nothing like this currently available. It couldn't be more different to those crazy $50 or $97 ebooks that promise everything (but don't really help at all!). The Strategy Course alone is worth that much. And my review service, and priority support is easily worth $50 a month. And that's without the newsletter and the big pile of extra toys! But I'm certainly not going to charge anything like that much! I want this group to be kept affordable for as many people as I possibly can. So I'm NOT even going to charge $20 a month. You'll probably think I'm slightly nuts, but when you join now you'll pay as little as $6.95 a month - yup, less than the price of a couple of fancy Cappucinos. I know that's crazy cheap, especially when you consider all my costs for things like web hosting, payment processing, software development etc. And the tax man of course (yes, he even demands a slice when it's just $6.95)! But the whole idea of this group is to make it affordable for all. I mean, how much do you spend on lottery tickets every week - wouldn't it be nice to see a few more winning tickets? Don't be one of those people still 'thinking about it' next week - join us today and let me start helping you out too. I hope you will choose to join us today, get your lottery strategy sorted, and enjoy being part of the Group. You're about to learn everything I know about playing the lottery. P.S. If there is any better lottery training / course / group / book or whatever out there, I'd love to know about it. Because in 10 years of looking, I haven't found it! So Who Am I Again..? Most people know me as 'the Lottery Guy', but as friends you'll know me as 'LG'. And I've been helping people online with lottery questions and tips since 2003. That's even before Facebook launched to the public, so I've pretty much seen it all in the lottery world. In fact I just checked, and in that time I've sent 5,139 personal emails (and counting...) just helping out fellow lottery players. Perhaps you were one of them? And that's not even including the many thousands who have subscribed to my lottery tips emails, and those who have been reading the blog. So that's a lot of people helped, and a LOT of emails - but lately it's just been getting out of hand! Which is why I've now launched my Private Members Strategy Group. Which means I can now give you the distilled contents of my brain. In a proper structured form. It took a few months, but I locked myself away in my home office furiously writing, and painfully dragging every tip and strategy I could out of the darkest recesses of my mind :-). So get the best lottery strategy training there is, with my personal help to boot - join us now. What Countries Does Your Strategy Support? Are My Lottery Games Included? This applies to everybody, all over the world :-). So if you're in the USA, UK, Canada, Europe, South Africa, South America, Australia, New Zealand or anywhere else where you can play the lottery - then yes, this is for you. Because they know what they are doing - they are trusted by 169 million customers in 202 countries round the world. There is zero risk to your personal data - none of your card or bank details ever leave PayPal making it super safe for you to use. Yes, you can, via your PayPal account (just add your card as a funding source in your PayPal account). It is possible to just use your card directly without a PayPal account, but not for a monthly subscription. If you would like to do this please contact me for details - bear in mind you will need to pay for 12 months at a time though. Do You Accept Payment By Check/Cheque, Money Order Or Bank/Wire Transfer? Sorry, but no. It's just really impractical and a huge admin headache to take manual payments. Setting up a PayPal account is really easy and available in most countries now. If your country is not one of them or you have some other reason for not wanting to use them, just contact me here and we can probably figure out an alternative. What About Paying By Cryptocurrencies (BitCoin/Ethereum etc)? Possibly. It depends which currency you want to use, and how long you want membership for. Contact me and we can figure something out. Can I Cancel Whenever I Like? How Do I Cancel? You can cancel any time you like, you are not tied into anything. Very few people do cancel :-). But if you ever do decide to, it's really easy, you can either just send me a quick email and I'll take care of it - or you can cancel from your own account. You're always in total control. Am I Locked In For A Specific Time Or Contract? No, there is no fixed term or contract. Membership is on a month-by-month basis, and you can cancel any time you like. 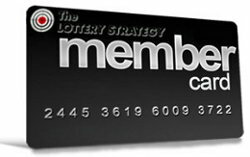 What Is The Difference Between Premium & Standard Membership? Premium Membership includes everything in Standard. But it also provides Personal System Reviews, i.e. when you see a new system come out that you're tempted by, just contact me and I'll check it out for you and let you know if it's worth buying. You also get Priority Personal Support, so can ask questions and get my personal support throughout your membership. Standard members can still contact me, but Premium Members get more detailed answers and will take priority over everyone else. If you think you'll have questions, it's best to go Premium. Can I Switch Between Premium & Standard Memberships? Yes you can - just use the members contact email and that can be arranged. Yes we can arrange that for you if you prefer an annual payment - contact me here. Can I Use My Phone/Android Tablet/iPad? Most of the course, information and the monthly newsletters are provided as PDF files. These are readable on pretty much any device. Most devices will already include a 'pdf reader' app or program - but if not already installed there will be a free one you can download from the app store. Some of the tools are web browser based so will also work on any device. A couple of the tools however do require a Windows laptop/desktop computer. These are not essential but just so you know. Membership is an on-going thing if you want to keep using all the tools and services etc. But to at least get the best out of the Strategy Course it's best to plan on being a Member for at least 3 or 4 months. How Is This Different From <anything else>? Do You Have To Be Really Good At Math(s)? No, you really don't. I specifically designed everything to keep any math either pretty easy, or completely out of it. I do provide more in-depth explanations sometimes for those that want it (but you can safely ignore those bits without any problems). Who Is This Really For? Who Will Get The Best From Joining? The Group is designed for most average normal lottery players. Because you are the ones who will benefit the most. It will help you focus in and maximise your chances of winning, because most lottery players have no idea how to do that. It's not your fault, this stuff can be complicated, and it's not helped by all the crazy bad misleading information there is online about how to play. If you want to cut through all that, this is for you. However, if you consider yourself an advanced player who thinks they already know everything there is to know, then this is probably not for you ;-). Will I Need To Buy Anything Else? Do I Need Any Extra Expensive Software Or Anything? No, you don't need to buy anything else - except lottery tickets of course! Everything else you need is included with your Membership. Will I Win The Jackpot This Weekend If I Join? I have no idea. Will joining guarantee you jackpots or turn the lottery into a reliable income..? No, of course not, that would be highly unrealistic. Luck will always have the final say, and nothing can change that. But will you maximise your chances of winning if you apply everything I teach you? Yes, you will. I Have Bills To Pay/I Am In Debt - Can This Help Me? No. Playing the lottery is not a reliable solution to debt or money problems. Buying the odd ticket is probably not going to hurt, but never spend money you cannot afford to lose. Membership is only on a month-by-month basis anyway, so worst case you decide it's not for you and cancel. You still get to enjoy a whole months membership and learn a few useful things anyway! So you can't really go wrong. Hopefully I managed to cover any questions you might have about the Group. But if not, please do just ask - you can use the chat option or the link below.